← Health Insurance Profits Booming: Recession, what recession? 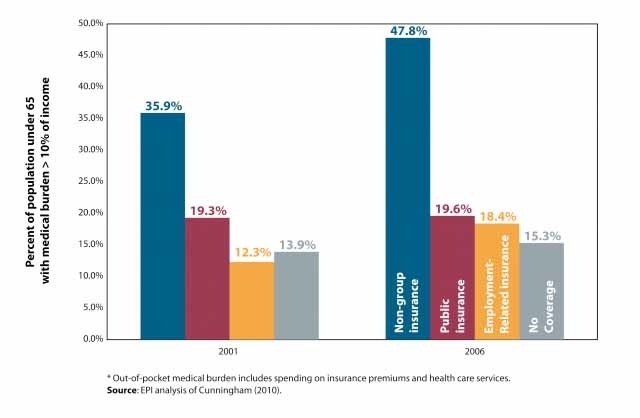 The graph shows the proportion of those covered with various types of Health Insurance paying more than 10% of their income out of pocket (not covered by insurance) for medical expenses. Note the poor coverage offered by the non-group insurance when compared with the relatively stable public insurance. Medicynical Note: Insurers would like us all to be in the individual group. Basing their premiums on a person’s pre-existing condition so as to charge those with illness more (perhaps so much that insurance is unaffordable). Incidious as it may seem their unstated goal is to make health insurance unaffordable for those who use it, and need it most. How else to explain the huge rate increases being requested in various locales by insurers on people with individual coverage. Alternatively, insurers offer insurance that is less comprehensive with more out of pocket expenses as noted in the graph. At a minimum insurers offerings must be based on community risk rather than individual risk. This assures insurability for those with the misfortune of having and developing problems. For this to work as has been noted by our government, economists and others caring about the issue, an insurance mandate is necessary–similar to that used in car insurance.